Humour and Presentations: Yes or No? Sometimes, I feel like all of us professional presentation coaches are either a bit hypocritical or bit egotistical. We all collectively seem to have the opinion that humour is really beneficial if done well, but disastrous if not. “Unless your really good at it (CAVEAT) don’t try, the risk is too great” and then we take to the stage ourselves and start off or end with a joke. Well, I want a set of rules. When can I tell a joke? What can I tell a joke about? Enough of this avoiding the issue, lets given the clients the rules (even if complicated and needing practice) and then let them decide to try it or not. I have some ideas, some great blogs and resources and a few good books and so far some pretty clear ideas on what may be a set of rules but what do you think? Where have you seen it work? Seen it fail? If a picture paints a thousand words, why do we use thousands of words and one picture (pie chart!) 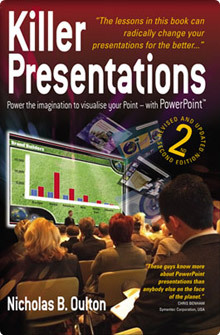 in our presentations? When, how and why should we use icons in a visual presentation? Iconography is often associated with art or religion (Cross, Star of David, Ichthus (little fish shape used by Christians during times of religious persecution now seen on the back of cars) but the idea of using a small image as a symbol has a long tradition. 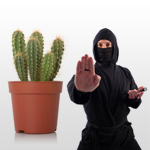 Last year at the ISSM, I gave a presentation called “Friendly Assassins and Enemy Plants.” This refers to fact that many presenters often face their biggest hurdle when they are rehearsing in front of a critical leader/boss/coach. There to help and encourage, the presenter’s team often winds up breaking their spirit by nit-picking too much and failing to mention what was done well. Most people couch the feedback with, “Great (insert positive qualifier), but…” and then a list of mistakes.